Trackmania Nations Forever is a free-to-play installment of the popular Trackmania series. This is a racing game where players compete on wild and ridiculous tracks at high speeds. Each player can retry the track as often as they like, but when the time runs out, whoever had the fastest run is the winner. The game also includes a track editor, so that you can make tracks as ridiculous and as hard as you want. If you want to play the game online, it is easy to find plenty of players and active servers. When I first played Trackmania, I was a bit turned off by it. Why? Because there is little interaction between players. You can't bump your opponents off the road; there's no red shells to throw; you can't even collide with them. I thought this was very unusual. But then I played it some more...And then I played it for a few hours straight. This is a very fun game. Yeah, you can't mess with your opponents, but that's not what this game is about. It's pure racing, just you against the track, against the clock. Oh, your friend finished in 53 seconds? Well, you've got 3 minutes left to do better--try not to mess up on that tricky turn there. 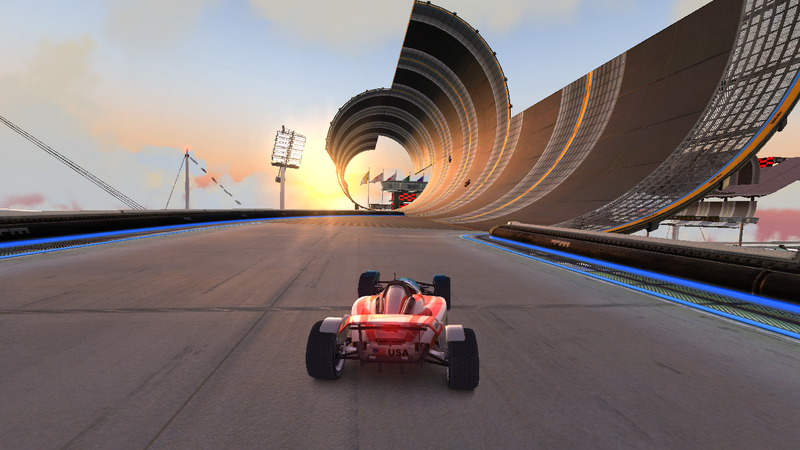 And it is clear why they call it Trackmania. The tracks are full of loops and spirals, terrain changes, and impossible jumps. And since there is a track editor, you can find a lot of amazing tracks online, or brew your own and share it with your friends. The only real downside of the game is that they want your money (not that they don't have a very good reason to). There are quite a few in-game advertisements for Trackmania United. Also, if you play online as a free user, you're only allowed to do five races in a row before you have to sit one out. However, all in all this game is excellent. Get a few friends together, start up the LAN, and have a blast racing. And if you like the game a lot, consider buying the full version. Also, if anyone has a more accurate number for maximum players, please let me know. Best free game that I have ever played. You can create huge custom tracks varying in elevation and road surfaces. You can download hundreds of cars for the game and modify the paint scheme yourself, and best of all it is a great online racing game that awards you ladder points for winning. It also has a great single player mode where you attempt to beat track times against a ghost car with mutliple difficulty levels. No longer free. Just a demo of 20 minutes/ day.